I constantly challenge myself to come up with unique ways to celebrate author and illustrator birthdays with my family. Sometimes the ideas take quite a bit of planning, many days to complete, and even cost a lot of money. Our latest Dr. Seuss birthday celebration comes to mind. However, I love when a simple idea ends up having a real impact on my children. 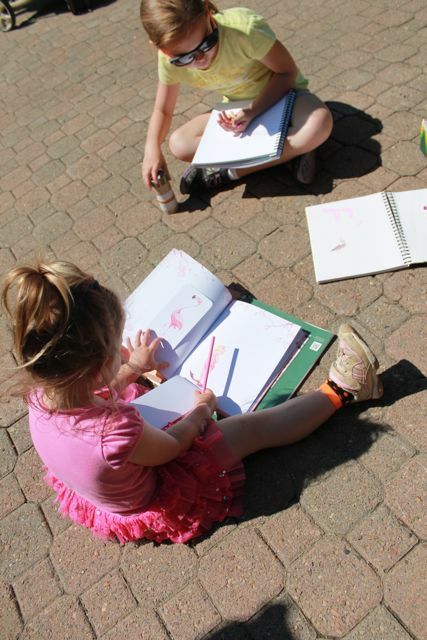 In this week's birthday celebration for Molly Idle our celebration was simple, just like Molly's illustrations; "Just pencils and paper. Pure and simple." (Molly Idle described her drawing style at Seven Impossible Things). Molly Idle is the illustrator of over a dozen picture books for children including Rodeo Red by Maripat Perkins, Zombelina by Kristyn Crow, and her own Tea Rex. She loved to draw when she was a little girl and had many people in her life that supported her artistic interest. She told Publishers Weekly, "My mom is an actress, and an artist as well. When she was painting she would let me use her easel and use her paints. That was really important - to be taken seriously and to be treated as an adult." At the age of 12, after seeing the movie Little Mermaid (for the 12th time!) she focused her career aspirations on becoming an animator. She was so serious about this dream that she sent a letter and some of her drawings to Glen Keane, the designer and creator of the Ariel character. He wrote her back with the advice, "What you need to do is draw all the time, from life." (Publishers Weekly). Molly Idle went on to study drawing at Arizona State University and was hired to draw for DreamWorks Animation. She spent five years working on the animated movies, The Road to El Dorado, Spirit: Stallion of the Cimarron, and Sinbad. Then, DreamWorks made the decision to make all their movies with computer-generated imagery (CGI) animation. After six months of training, Molly realized that CGI was not for her. Remember Glen Keane and how he influenced Molly when she was twelve years old? 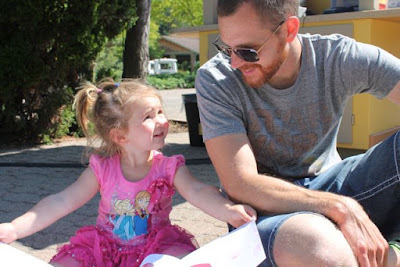 He helped her again during this time of transition in her life. Molly heard him speak at a conference and someone asked Keane to express his views on being a traditional artist in the coming computer-generated artwork world. He said, "I think if you want to do something, you need to make a place for yourself." (Publishers Weekly). It was exactly what Molly needed to hear. She told Seven Impossible Things, "So, I started thinking about what else I could do for a living that would allow me to draw all day, because drawing was (and is) what I really love to do. Little did I know, when I started pursuing illustration, that what I would find would be so much more than just another way to earn a living. I would find the artistic love of my life, making books." (Seven Impossible Things). 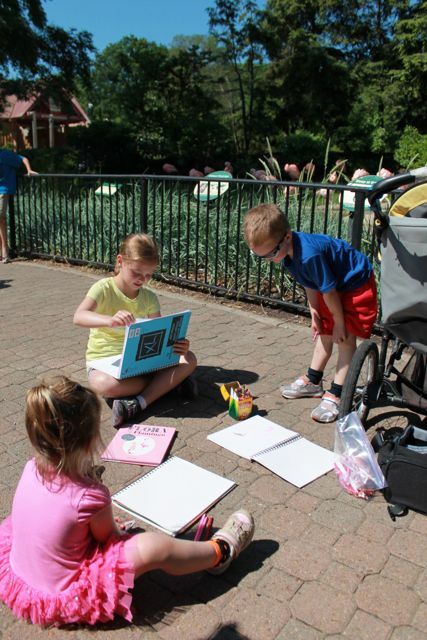 Molly illustrates her books with Prismacolor pencils. "I love pencils. The feel of them in my hand. The precise line-work they can produce. The smell of the pencil shavings. Heck, I even love the little 'scritching' sound they make as they move across the paper." (Seven Impossible Things). To create an illustration she layers many colors on top of one another. She told Kathy Temean, "Rex's green skin in Tea Rex is made up of layers of 11 different pencils: Black Grape, Black Raspberry, Indigo, Green Ochre, Artichoke, Limepeel, Chartreuse, Yellow-Chartreuse, Yellow-Ochre, Goldenrod, and Sand." 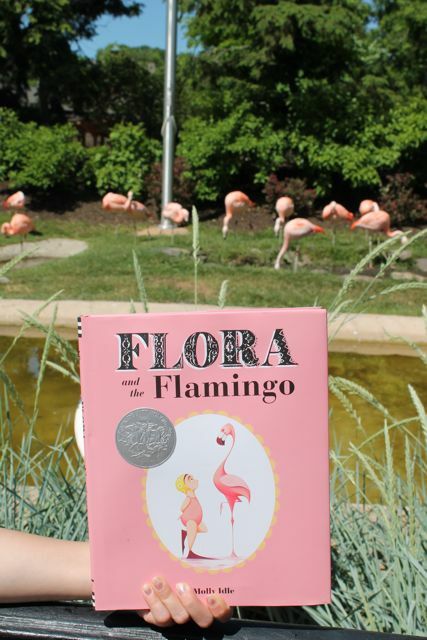 Her colored pencil illustrations caught our attention with the books Flora and the Flamingo, which was awarded a Caldecott Honor in 2013 and its sequel, Flora and the Penguin. In addition to the simple colored pencil illustration, Molly incorporated flaps that really make the books unique. 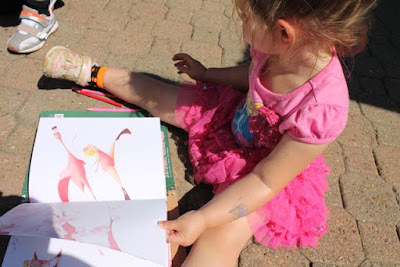 "These books are all about movement. I'm very conscious of trying to keep the poses moving, and to utilize the flaps for times when one pose just isn't enough to convey what's happening." (Horn Book). Last September, my family was lucky to meet Molly Idle at the National Book Festival in Washington, DC. 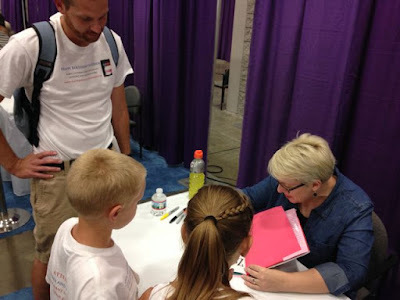 She signed our copies of Zombelina, Circus Fantastico, and Flora and the Flamingo. She also shared her birthday with us when she signed our National Book Festival poster. When I was planning our author birthday celebrations for the month of June, I thought going to the zoo would be the perfect way to celebrate Molly Idle's birthday and to kick off summer break as a family. 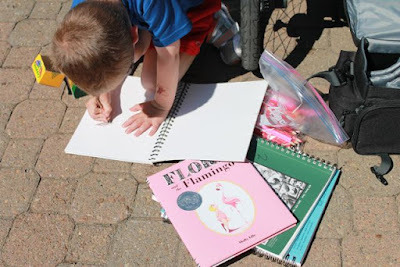 The weather cooperated and on the first day of summer break, I packed up the kids, picnic lunches, water bottles, camera, and our Flora and the Flamingo book to head to Cleveland Metroparks Zoo. All the kids were in the van, ready to go, when I realized that I forgot my coffee. I went back into the house and had the last-minute idea to bring colored pencils and sketchbooks to the zoo for my children to sketch the flamingos. I am so glad that I had this idea because this week while researching Molly Idle I found this quote in an interview with Kathy Temean, "I don't work from photo reference -- but if there is something I want to study I will make observational sketches. 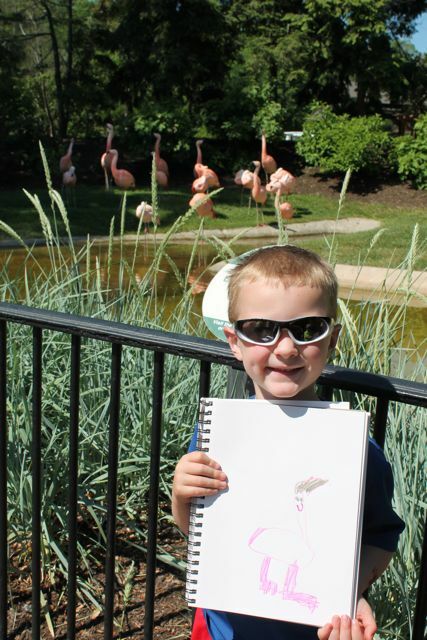 Like...go to the zoo and sketch real flamingos -- then go home and draw more flamingos -- using my sketches for reference." 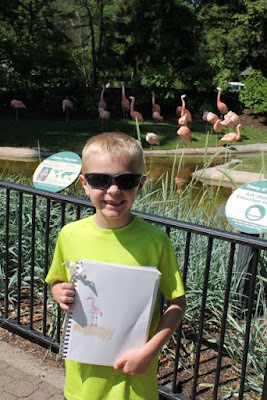 The flamingos almost greet you as you walk into the Cleveland Metroparks Zoo and after a quick visit to the elephants my children were ready to draw a flamingo in their sketchbooks. 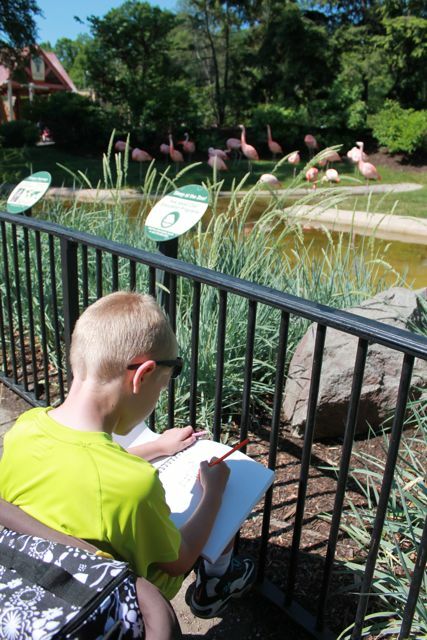 We waited for a large crowd of people to clear away from the flamingo exhibit and then we found a comfortable spot to draw. Someone said to me, "Is it art club today?" I said, "No, just something fun to do on first day of summer break." 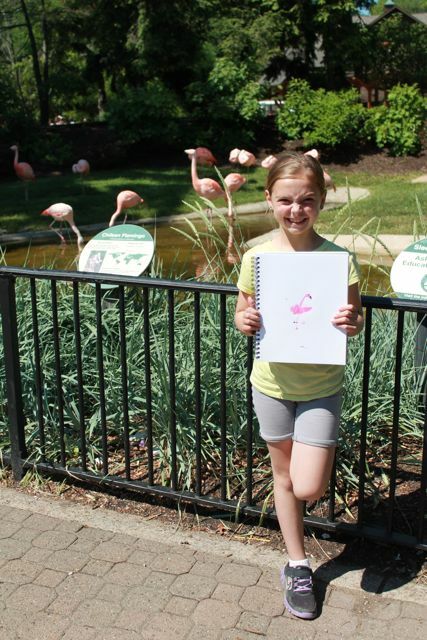 My youngest daughter was not interested in drawing a flamingo, but she could not resist reading the Flora and the Flamingo all by herself. Flora and the Flamingo is a wordless book about a girl and a flamingo who learn, despite their obvious differences and a few ups and downs, that they can perform a dance together in perfect harmony by trusting and respecting one another. 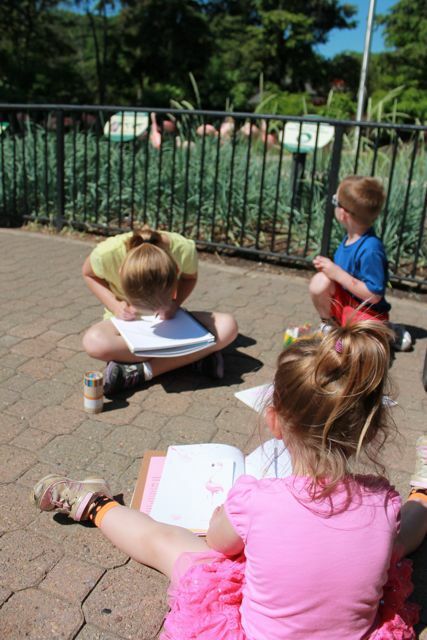 This very simple art activity was only about 15 minutes of our 5-hour day at the zoo. However, I hope they will remember this every time they see a flamingo at the zoo or see the book Flora and the Flamingo. 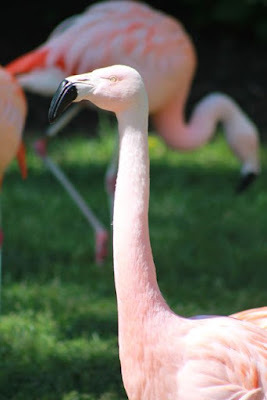 Wearing pink just like the flamingo. I asked my oldest daughter to stand on one leg for her picture for sentimental reasons. We used to go to the zoo once a week when she was little. She loved the flamingos. 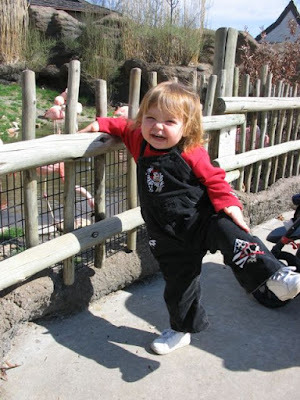 Here she is standing on one leg, eight years ago. 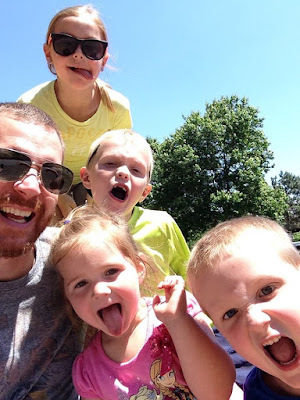 I am a lucky daddy! Do you follow Happy Birthday Author on Pinterest? Please pin this picture. 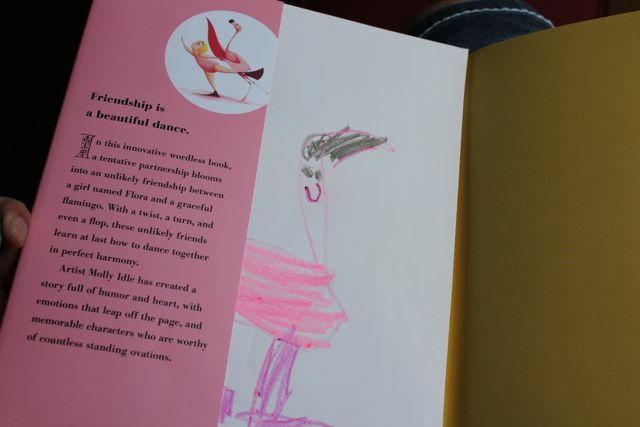 I placed all of their flamingo sketches inside our book. We will be able to remember this day for years to come each time we reread the book! 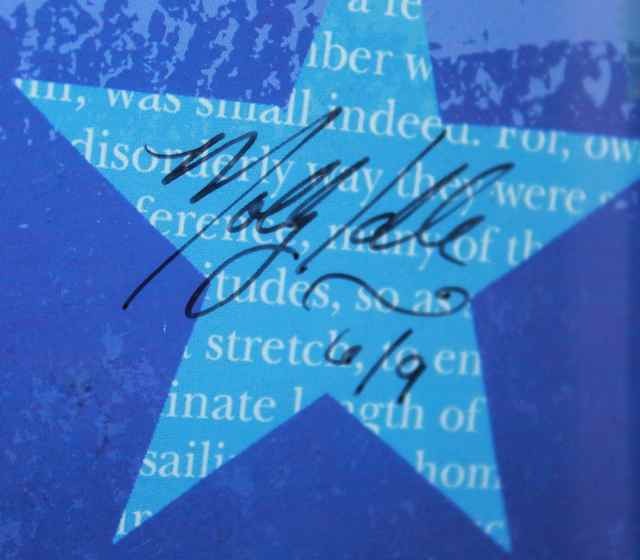 Check out Molly's latest book, SEA REX! It was just released on May 26, 2015!